Can Having My RV's Waste Tanks Pumped Out Damage Them? I have heard that having a "honey wagon" pump out my black and/or grey water tanks can sometimes cause the tank to collapse. Is this true? And if so, how can I avoid damage in this situation? ANSWER: Hi Steve, the answer to your question is yes having your RV's Grey and Black Water holding tanks pumped out could damage them and possibly collapse them. Now for the good news; as long as the tanks are pumped out properly the chances of having this happen is almost non-existent. You can avoid this from happening to you by using a company that is experienced in pumping out RV Holding Tanks. That's basically all you have to do. 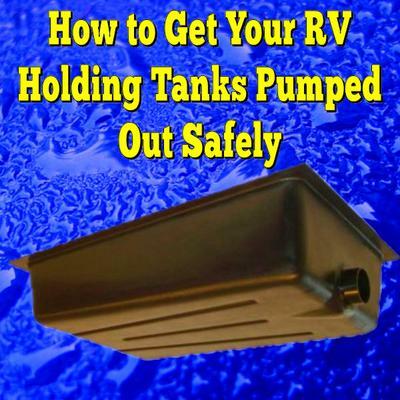 Yes there have been times when an RV's Holding Tank has collapsed when being pumped out. But the reasons for this happening are the tank was subjected to too much suction as well as having a faulty venting system. One other prudent step you can take is to make sure that the company you use has it in writing that they will repair any damage they cause to your RV while performing the tank pump out process. So, rest assured that if you follow the guidelines above that the chances of having a tank collapse are slim to none. Hope this helps. Comments for Can Having My RV's Waste Tanks Pumped Out Damage Them? do you have any suggestions as to go about finding a good company to pump out your rv? i mean what do you google to find such companies?